In large bowl, stir together Bisquick mix, graham cracker crumbs, egg and milk with whisk just until blended. Heat griddle or skillet over medium-high heat (375°F). Brush with vegetable oil if necessary (or spray with cooking spray before heating). For each pancake, pour about 1/4 cup batter (or desired amount) onto hot griddle. Cook about 3 minutes or until bubbles form on top. Turn; cook other side until golden brown. 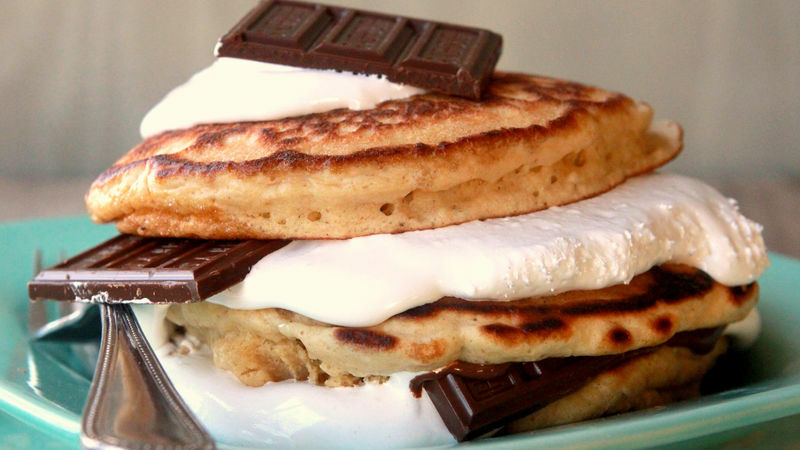 Stack pancakes with marshmallow creme and chocolate bars. Serve with syrup. Try making these pancakes into tiny, cracker-size rounds for an extra-fun breakfast treat. Spread peanut butter on top of your pancakes to make Peanut Butter S’mores Pancakes.